Complete the simple knife sharpening service order form. LOOKING FOR A PROFESSIONAL KNIFE SHARPENING SERVICE YOU CAN TRUST? Finding a great knife sharpening service can be hit or miss. Just because there's a sign on the door and a grinder in the back doesn't mean you'll get exactly what you were expecting. You won't find a "one grind fits all" mentality here! Rather, we sharpen and hone all knives using a multi step process to achieve the sharpest edge possible. 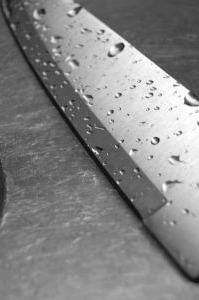 Your knives will last longer as this process removes only a minimal amount of metal and gives a very stong, long lasting edge. SHARP KNIVES ARE JUST A FEW DAYS AWAY! Having your knives professionally sharpened couldn't be more convenient. Get your knives sharpened by mail, at your door or at local events. Contact us today and you will be enjoying razor sharp knives in just a matter of days. 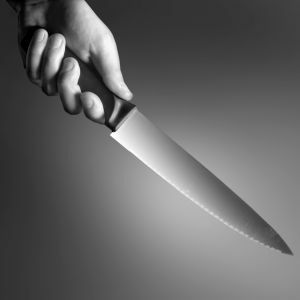 Read more about our professional knife sharpening services.